For a taste of France, toss a knob of this butter with roasted vegetables as soon as they come out of the oven. It's especially nice on roasted asparagus, Brussels sprouts, butternut squash, carrots, fennel, green beans, mushrooms, parsnips, potatoes, and sweet potatoes. Heat 1 tablespoon of the butter in a small saucepan or skillet over medium-low heat until melted. Add the shallot and cook, stirring frequently, until deeply browned, 8 to 10 minutes. Remove from the heat and stir in the thyme. Cool completely. In a small bowl, combine the shallot mixture with the remaining 2-1/2 tablespoon butter and the lemon zest. Stir to blend well. Lightly season to taste with salt and pepper. 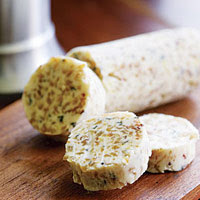 Scrape the butter onto a small piece of plastic wrap, mold into a log shape, and wrap in the plastic. Refrigerate until ready to use. Toss about one-third of the butter (a generous tablespoon) with a batch of vegetables after roasting. This entry was posted on 2:26 AM and is filed under Sauces . You can follow any responses to this entry through the RSS 2.0 feed. You can leave a response, or trackback from your own site.